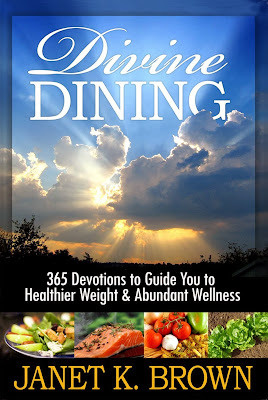 A 365 day devotional by Janet K. Brown. Her passion for diet, fitness, and God's Word inspired her to help others in their search for a weight loss method that is in keeping with what the Lord wants for us. To the thousands of men and women who strive to be Christians, but suffer from compulsive overeating they can't control . . . THERE IS HOPE! Visit Divine Dining to pick up your FREE copy! !